It's 1930, and in two hours' time there will be a total eclipse, bringing about the effects of an ancient curse which will annihilate the Earth. You have to reach the top of a pyramid and destroy the statue there before the eclipse. 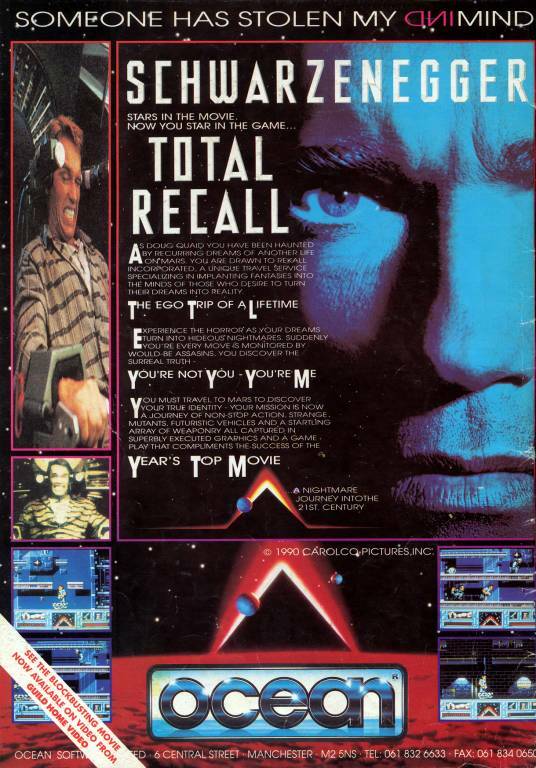 This is one of the Freescape games and the 'true' 3D is quite impressive. Making a map of the pyramid is quite difficult, though! There isn't much sound – mainly gunshots and the constant beat of your heart – but it seems to make the tension that bit more realistic. See also: Total Eclipse II: The Sphinx Jinx. There's going to be another total eclipse soon! Twelve parts of the Sphinx have gone missing somewhere in the catacombs, and you have only one hour to find them. The gameplay, graphics and sound effects are all much the same as the original game, although there are a few new puzzles; try fathoming your way through the Jinx section, for instance! This game was originally only available as a bundle with Total Eclipse through the Home Computer Club, and it would be just as good as the original, but for one incredibly stupid room which contains an invisible maze, which is immensely frustrating to solve (and not surprisingly, I've never managed to solve it). You'll still have fun with the rest of the game, though. Doug Quaid isn't sure who he really is, and after visiting a company called Rekall Incorporated which can implant memories into people, he goes to Mars to discover his true identity. 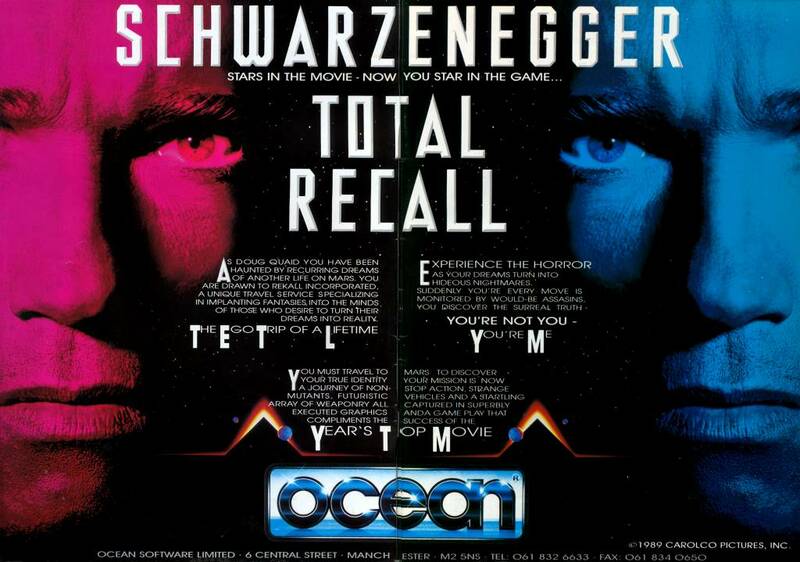 The game consists of five levels which are based on the film of the same name. 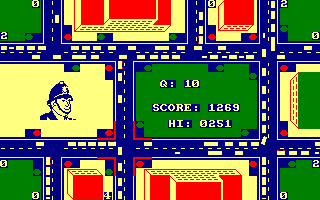 Three of them are platform games which also contain puzzles, where you must flick the correct switches to gain access to some areas. There are also some men (armed and unarmed) which you must kill. The other two levels are driving games with a shoot-'em-up element. The graphics are very good, particularly on the platform levels, and the two pieces of music are simply wonderful. However, the gameplay is rather difficult for my liking, particularly on the second level. Watch YouTube videos of this game by: Axelino, ChinnyVision, jgonza. 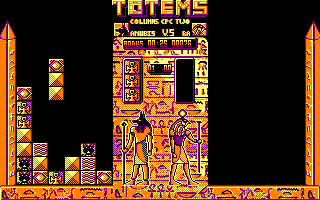 This game is a version of the Sega classic Columns with a distinctly Egyptian theme. Columns of three blocks, each engraved with a symbol, fall from the top of the screen, and you must create horizontal, vertical or diagonal lines of three or more matching symbols. It's a simple concept which is quite similar to Tetris. 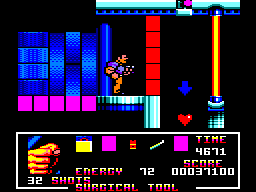 The graphics are beautifully drawn using the CPC's four-colour mode, and several playing modes are included – classical, stage mode (achieve a score within a set time limit), time attack (score as many points as possible within three minutes), and a two-player 'versus' mode. This is an excellent game and is much better than ESP Soft's previous version of Columns. 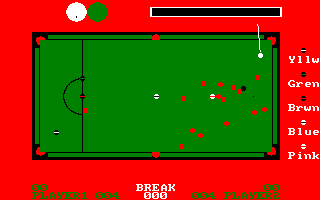 There are a lot of snooker simulators for the CPC and this is one of the earlier ones, which was later re-released by Code Masters as Professional Snooker Simulator. The first thing you'll notice about it is that it's in four colours, which is a bit strange when you need at least eight. Even though it says which ball is which on the screen, it is still confusing, and not only that, the method of aiming is awkward; instead of pointing a cursor at your target ball, you must rotate the cue about the white ball, and the strange controls make this tricky to get right. From all of this, you'd think there wasn't much reason to rate this game – and you'd be absolutely right. Take part in a cycling race held over four stages, and try to amass the shortest time possible over all the stages. The first and last stages are viewed from the side and require a lot of joystick waggling to build up and maintain your speed, while the second and third stages are viewed from overhead, and don't require any joystick waggling. You have to finish within the top six to go to the next stage, although a training mode is also available. 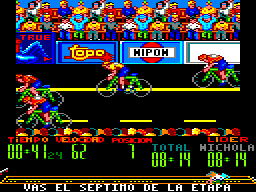 The graphics are brilliant and really colourful – I like the animation of the crowd cheering the cyclists – and there's a jolly tune to accompany all of the action if you have 128K of memory. You don't have to waggle the joystick really hard, though, and all in all, the game is good fun. 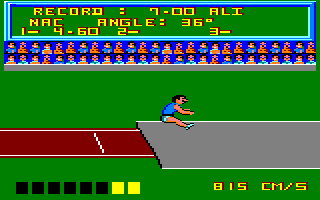 Based on Konami's 1983 coin-op game, the Amstrad CPC version by Ocean was released as part of their Game, Set and Match 2 compilation and comprises six sporting events to compete in – the 100-metre dash, the javelin, the long jump, the 110-metre hurdles, hammer throwing and the high jump. You can start at an easy level and progress through the events rather smoothly, hurdles probably being the hardest of the lot. Every time you reach a new world record, you are rewarded with it being shown up in lights. The qualifying times or distances are very reachable and when you complete all six events you start back at the first event and the qualifying times and distances become more challenging. I quite enjoyed playing the CPC version; the only problem is that it's one of those infuriating joystick waggling type of games. Your country failed miserably in the World Cup, and having been appointed as the new manager, you must concentrate on the Nations Cup before preparing your team for the next World Cup. The game features all the players from over 50 countries, which is pretty good, although unless you play England, you're going to have to spend ages entering player details in. For some reason, a lot of people seemed to like this game. I don't; it's text only, for a start, and the match highlights go on for as long as ten minutes while a running commentary appears on the screen – not exciting stuff at all. Anyone who has ever been to London (or most other cities in England, for that matter) will know how bad the traffic jams can be. You've been appointed the head traffic controller in London, and you have to change the traffic lights manually so that the traffic flows smoothly. 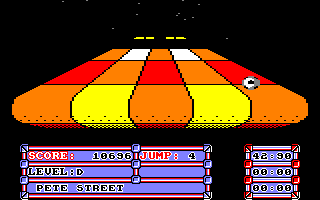 Inevitably, queues of cars build up and go off the screen, and if they become too large, the game ends. It takes a while to get the hang of things, but it becomes very challenging when you do. As you progress from one part of the city to the next, managing the traffic lights becomes increasingly manic as you move your cursor from one set of lights to the next, constantly keeping an eye on the build-up of vehicles at each junction. The graphics and sound effects are very basic indeed, but the gameplay is engaging and there's no other game like it on the CPC. A colourful and exciting game in which you control a bouncing football and have to reach the other end of a course which is made up of coloured tiles – and lots of chasms, which of course you mustn't fall into. The tiles affect the ball in different ways depending on their colour. The course scrolls towards you so fast that you barely have time to look ahead, so remembering the layout of all fourteen courses is vital if you want to complete them. Fortunately, there's a practice mode which gives you lots of time to complete each course. The graphics are excellent and the scrolling is really fast and smooth, and the music only adds to the thrill and the tension – it's great stuff.